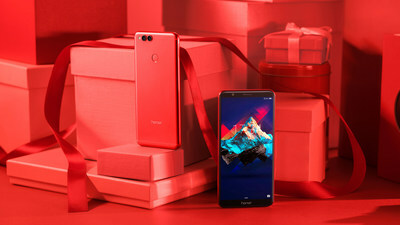 LAS VEGAS, Jan. 8, 2018 /PRNewswire/ -- Honor, a leading online smartphone brand geared toward digital natives, announced the availability of a new color in the line of its flagship 7X devices. Honor also introduced new facial recognition and unlocking functionality to the 7X. Beginning in Q1 of 2018, customers will be able to access facial unlock through an OTA update. This is the first time such functionality will be available globally at the $199 USD pricepoint. Honor, a young, innovative and trendsetting brand, had a record year in 2017. According to Sino Market Research, Honor lead the online market for smartphones in China in terms of both sales volume and revenue between January and November 2017. Further, the Honor 7X line marked 40M units sold globally in December 2017. The flagship line also saw record sales on Single's Day in China in November 2017, generating more than $600M USD in sales and driving triple-digit growth on Black Friday in the US and Europe. The new color and facial unlock feature are just the latest ways that Honor continues to optimize the user experience at an unbeatable price. In addition to black, blue and gold phones, a new Red 7X will be available in limited quantities globally. Red version offers customers a passionate, energetic new color and a terrific out-of-box experience. Honor today also announced a partnership with Monster, based on a previous collaboration with Honor around the Honor 9 smartphone, this latest partnership agreement with Monster and Honor 7X brings the working relationship to the next level. 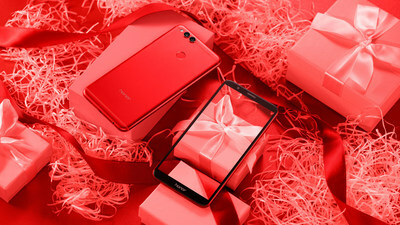 As a way of celebrating the launch of the partnership, Honor will award the first 100 customers in each global market to order the limited red edition a set of AM15 Monster earphones as a special bonus. "The red edition is always special and exclusive to flagship products," says George Zhao, President of Honor. "The line already comes in black, blue and gold, but this is the very first time Honor is introducing this new color to global markets as part of our Honor 7X line. It's limited to just 20,000 in overseas market, so we hope customers around the world will enjoy this exclusive new offering. It won't be around for long." As an update to the highly-rated Honor 6X, the 7X line is unrivaled in delivering the most premium smartphone features and hardware at just USD $199.99. The Facial unlock function will be soon available to all Honor 7X users in 2018 Q1. Facial unlock can be used to unlock your phone instantly by scanning a recognized user's face. As the first smartphone to feature the new Honor FullView Display; a 5.93 inch FHD+ display with 2160 X 1080 resolution and 18:9 ratio, Honor 7X provides the broadest viewing range and highest screen-to-body ratio in its price class. The fun doesn't stop there thanks to the spec'd out dual-lens 16MP + 2MP rear-camera with DSLR depth of field effects achieved with a larger aperture (F/0.95 – F/16). New Phase Detection Auto Focus (PDAF) technology auto focuses in as little as 0.18 seconds. The 8MP front-camera provides custom features that are a selfie-lovers delight. From premium hardware to intelligent software, the Honor 7X offers unmatched value. Tech savvy, deal-seeking, or statement making individuals can find their next unlocked phone at highly shoppable prices online on http://www.hihonor.com/us/index.html. 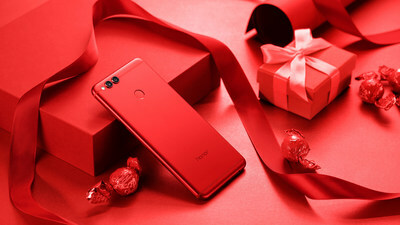 The red edition of Honor 7X make it an easy choice for your Valentine, which will be available for Valentine's Day in selected markets, including US, Western Europe, India and Russia.